So, you're all a bunch of scone-loving freaks, huh? I love it!!! (And it takes one to know one.) Here's the deal. These really are the best scones ever. Once I found this recipe, I can't bring myself to make any other. I also can't stomach eating scones from coffee shops, because my experiences with them, post-having the best scones ever, has been dismal, at best. 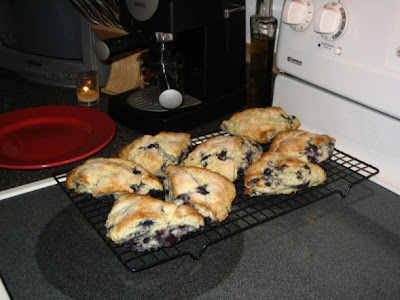 All other scones are sub-standard, blog-friends, really. You deserve better. Here is the recipe, with Megan-Commentary dispersed in the mix. It comes from no other than the best- Cooks Illustrated. You can find the recipe for FREE here, at America's Test Kitchen (CI's affiliated PBS TV show) complete with instructional illustrations, which are helpful, making this EASY recipe even EASIER. Registering for the ATK site is free, by the way, and you'll be glad you did. They are the BEST! And now, for the scones... If you make some, you'd better share with us!! And to those who asked, yes, you should bring coffee- I like mine with half and half. Ha! Did you mention something about leftover scones??? Let's just be clear that there would be no need for that part of the instructions at my house.... These look and sound totally and completely delicious! Oh, and I LOVE Cook's Illustrated and Cook's Country! ok so i was already hungry honey and now i am starving!! i don't think i can wait to bake them myself...so can you just maybe bring some over?? Seriously, I just drooled on the laptop!! Thanks for giving us the recipe! I've always loved the white chocolate raspberry scones from Java Junkie - maybe you tried them while you lived here? And now I can't wait to try to make my own scones! What a treat! Can't wait to make these!! Though I am a little intimidated by the length of this recipe! Ok...I made them...and they were all I hoped for and more!! Although I have to say I substituted chocolate chips this time. Sick I know. What can I say? I'm pregnant! !!! I love scones!!! Cannot wait to try these.